Welcome to The Panhandler! Our First Annual Fundraiser Disc Golf Tournament! We are having this tournament to raise funds for the improvement of our beloved local disc golf course Poor House Farm Park Disc Golf Course! Through exceptional effort we are getting 9 new field holes in addition to the traditional 18 wooded holes. All proceeds from the tournament will go towards this goal and making it the Jewel of the Panhandle! -Delicious catered BBQ lunch provided by Fat Jack's "Bartley-Q"
*We will be flexible with divisions if we have enough participants. Example: If 3 or more eligible players would like to play masters we can make accommodations. Tee time to follow shortly after players meeting. 2 rounds for every division. 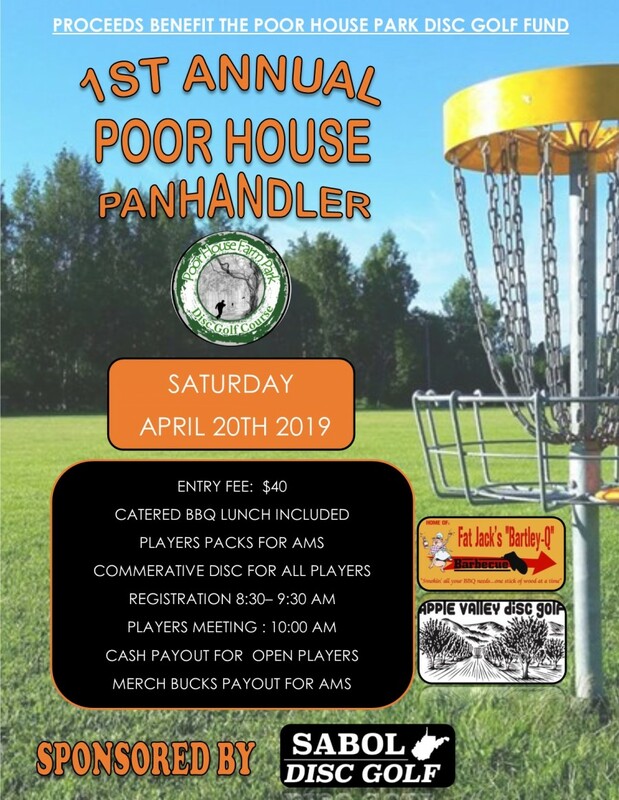 Lets have some fun and raise some money slingin' disc in the hills! Apple Valley Disc Golf is responsible for all refunds/cancelations.